What do we do when life lurches out of balance? How can we reconnect to one other and to what's sustaining, when evil and catastrophe seem inescapable? These questions lie at the heart of Stitches, Lamott's profound follow-up to her New York Times–bestselling Help, Thanks, Wow. In this book Lamott explores how we find meaning and peace in these loud and frantic times; where we start again after personal and public devastation; how we recapture wholeness after loss; and how we locate our true identities in this frazzled age. 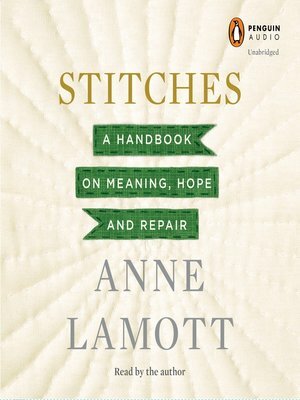 We begin, Lamott says, by collecting the ripped shreds of our emotional and spiritual fabric and sewing them back together, one stitch at a time. It's in these stitches that the quilt of life begins, and embedded in them are strength, warmth, humor, and humanity.